The Campaign for Sustainable Transportation is open to considering a variety of forms of transit that may be appropriate for the corridor or other arterial roads in the county. On this page is an article on bus rapid transit. The image above illustrates the example of Eugene, Oregon. If you want to share your thoughts, click here to write to us. 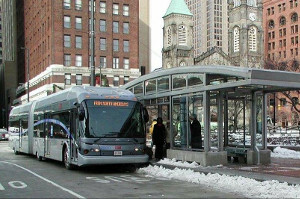 Bus Rapid Transit (BRT) is a high-quality bus-transit system that delivers fast, comfortable, and cost-effective transportation similar to metropolitan trains (Light Rail Transit). It does this through features that allow buses to move through a city without being delayed by general traffic and that speed up passenger boarding and alighting compared with ordinary bus transit systems. It also uses buses of higher capacity and higher frequency than conventional city buses usually provide. 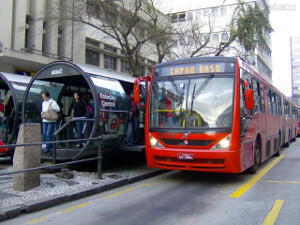 BRT was invented by mayor Jaime Lerner of the city of Curitiba in Brazil and first placed into service in 1974. His city could not afford a subway, but it was large enough that its streets were congested and the city buses were unable to move enough people quickly. 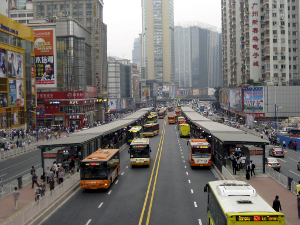 By creating bus-only lanes, unique bus stations that look like glass tubes with sliding doors, off-bus ticket purchases (like a subway), station platforms level with the bus floor, automatic ramps that bridge the gap between platform and bus, high-frequency buses (arriving every 90 seconds at the peak time), and traffic signals that give the buses a green light almost all the time, the Curitiba BRT achieved its goal of moving as many people as a subway could, but at much lower cost of construction. Few cities have been able to implement ideal BRT systems that have all of the features and amenities listed above. Due to the system cost or the difficulty of fitting exclusive rights-of-way into existing city streets, BRT systems vary greatly. To make some sense of the variations and the essential features, an organization called The Institute for Transportation and Development Policy (ITDP) has developed a standard and a checklist to classify and score BRT systems. The standard classifies the systems into categories: Bronze, Silver, or Gold rankings, and the lesser category which some call “BRT Lite” that implements some but not all of the essential features. 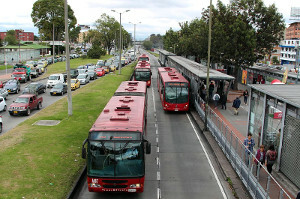 Click here to read the BRT standards. Albuquerque Rapid Transit is owned and operated by the city's transit department, ABQ RIDE. It is the first form of transit in the city of 560,000 to use a dedicated guideway. The project is being built using the Construction Manager at Risk (CMAR) model at an estimated cost of $133.6 million with $75 million of that budget from the Federal Transit Administration. It launched as a very limited service on an incomplete system in November 2017, just before the mayor's term ended. The new mayor revealed in January 2018 that the project had construction and design flaws under the prior administration, which will delay the start of full service and will result in a cost overrun, but he's committed to getting the system operational as soon as possible. The Regional Transportation Commission (RTC) of Santa Cruz County is conducting a major study of the best improvements it could make on 3 corridors that traverse the county along its length. The study is called the Unified Corridors Investment Study (abbreviated UCS). It is expected to report its findings to the public in the fall of 2018, and a decision on which projects to implement is expected to be made by the RTC by the end of the year. Among the projects being considered are implementing a BRT Lite system on Soquel Avenue/Soquel Drive/Freedom Blvd (purple and orange lines on the map above) and/or creating a BRT corridor between Watsonville and Santa Cruz which could involve a mixture of exclusive BRT lanes on the railroad right-of-way (black line) instead of the tracks, combined with bus lanes on streets that run more-or-less parallel to the tracks. Below is a recent map of the potential BRT corridor involving the railroad right-of-way. Click on the map to toggle it in and out of fullscreen. I will be visiting the city of Eugene, Oregon, in July 2018 to study the BRT system there, called the Emerald Express (EmX). The EmX was built in 3 phases, with the last phase opening for service in September 2017. There was a lot of controversy among the residents of Eugene and the Lane Transit District (LTD) over the cost, route, and need for the EmX westward extension. The first phase built an east-west EmX line between downtown Eugene's existing bus station and downtown Springfield, the town adjacent and to the east of Eugene. The second phase built an extension running northward to the Gateway neighborhood of Springfield where a major health facility, shopping district, and residences had been built. LTD has mapped locations for future expansions of the EmX system throughout Eugene. Cities from all over the U.S. and other countries have sent representatives to observe the EmX system and learn from it before implementing their own BRT system, but Santa Cruz County hasn't sent an observer yet. After I return and report what I learned from direct observation and interviews with key persons, this page will be updated with new information. Check back here at the end of July 2018 or thereafter.